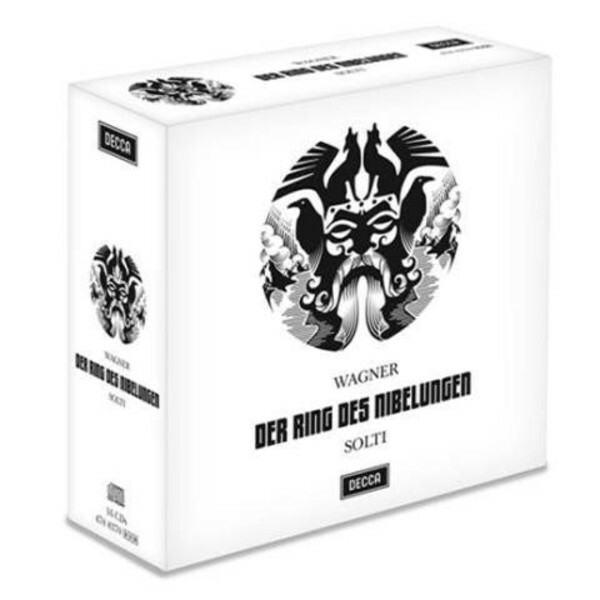 Sir Georg Solti’s recording of Wagner’s epic music-drama Der Ring des Nibelungen was a recording project on a scale without precedent and the first-ever studio recording of Wagner’s masterpiece. Recorded between September 1958 and November 1965, it was masterminded by legendary producer John Culshaw and his technical team under the direction of chief engineer Gordon Parry. This massive undertaking set new standards in both opera recording and the possibilities of the effective and imaginative use of stereo. The combination of Sir Georg Solti and the Vienna Philharmonic with an international cast of the greatest Wagnerian singers available resulted in a recording which was greeted with unprecedented enthusiasm and rave reviews and which quickly won numerous international awards. • Anti-scratch matt finish 16CD + BonusCD-Rom capbox box set featuring Solti’s immortal recording of Wagner’s Der Ring des Nibelungen as remastered in 2012. • An extensive 108-page booklet featuring written introductions to each opera by producer John Culshaw, synopses in English and German and many original session photographs. • Deryck Cooke's ‘An Introduction to Der Ring Des Nibelungen’ (CD 15-16). PDF transcript is also available on the CD-Rom. • CD-Rom containing complete libretti in original German with English translation and French translation.